Our first “real” trip out with the cameras led us into a spot of bother attempting to get a train into Cape Town city Centre, so this was our second attempt to get out with the cameras. After leaving our Airbnb accommodation we drove out of Cape Town. 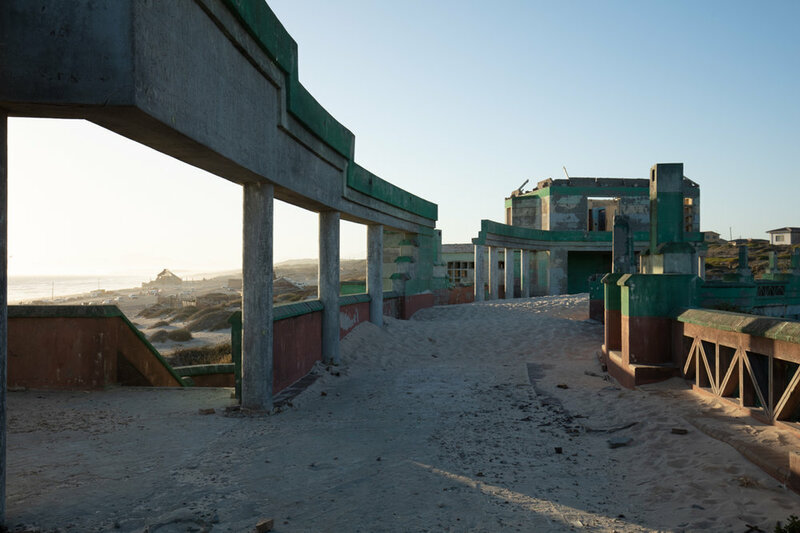 I came across Macassar Beach Pavilion online some months ago when I first came up with the idea of coming to South Africa as the first destination as a “Nomadic Photographer”. 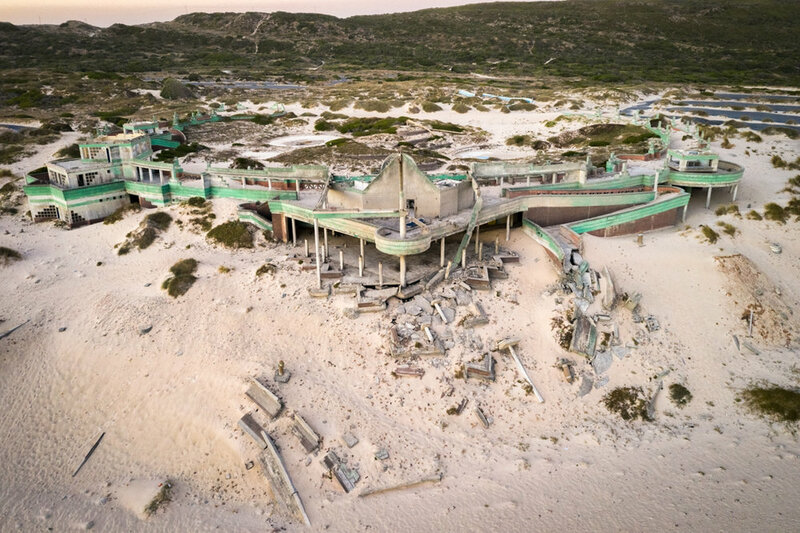 The pavilion is actually an abandoned water park which has since been overtaken by the sand dunes, and is around a 30 minute drive from Cape Town, in the Western Cape of South Africa but resides next to the notorious Khayelitsha Township. Inside out, looking out through the entrance. 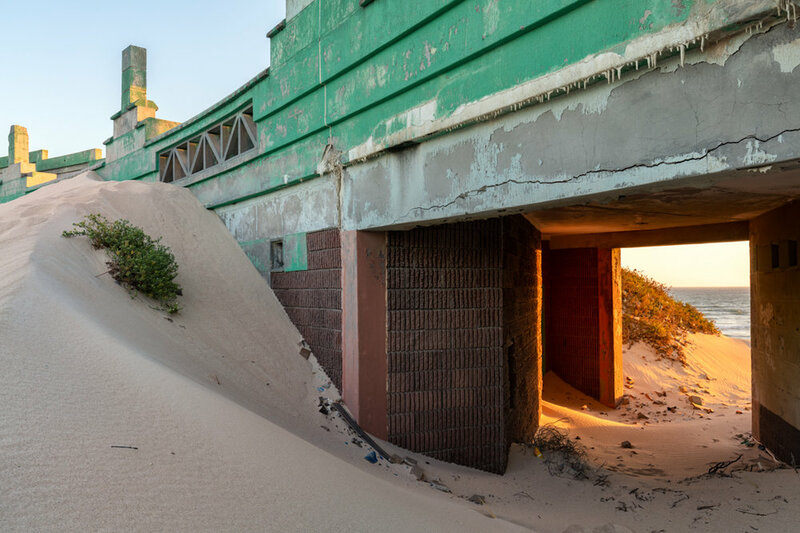 The Beach Pavilion is part of the Macassar Dunes Reserve and was built around 1991. 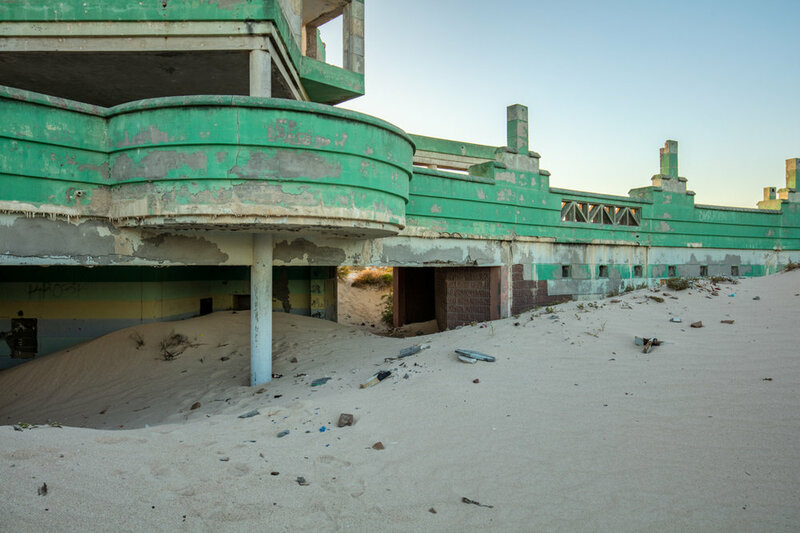 But now the sand fills every nook and cranny of the once vibrant blue buildings and external swimming pools. You can still however, make out the parking lot and the signage, despite the graffiti and sand. I thought it made for an interesting subject for our first shoot. Financial troubles hit the Pavilion around the turn of the year 2000, only nine years after opening its doors, when maintenance and staff salary payments began to fall short. And it required a lot of hard work to keep the place clean from sand as the surrounding dunes are known for their unpredictable winds and sand shifts. Neglect from both the employers and the employees began to show and this resulted in a drop in popularity among visitors, with that the water park went out of business and was closed for good after a decline of cash incoming. The right wing had the greater amount of sand covering the structure. I liked the shapes and the sand, but the lighting (back-light) was a challenge. My "image of the day”, I love the way the sand flows into the scene. A liitle fact about the surrounding area is that within the Macassar conservation reserve you will also find the last remaining forest of endangered White Milkwood Trees. A Southern African coastal tree, with dense foliage, black berries and small greenish flowers (See Image here). Before we left, I just about had time to throw my new DJi Mavic 2 into the air to capture some video and some stills (shown below), this gave a better over-view of the site. Want £25 off the price of an Airbnb stay?